Scrolling idly through Instagram last night a note that I had been ‘tagged’ popped up. ‘Top Wedding Photojournalism” it said. It transpires that I have won two awards in the latest round of the WPJA judging. This image is the first of those two, I’ll blog the next in a day or so. I’ve written before about the WPJA and the various awards I have received, This snippet from their about us page really tells you all you need to know. the Wedding Photojournalist Association (WPJA) has been the trusted authority for engaged couples seeking to document their wedding and its participants on that day as they really want to remember them. Recognized for its members’ creativity and craft by leading wedding publications, including BRIDES magazine, the WPJA reserves membership to select photographers around the world whose portfolios and practices demonstrate talent, expertise and client service in wedding photojournalism. Members of the WPJA — through their work as adjudged by news photo editors and award-winning photojournalists (including Pulitzer Prize winners) — represent the highest standards and the cutting edge in the business of creative wedding photojournalism. As professional visual artists, WPJA photographers capture the real moments and emotions of the most important celebration in the lives of two people coming together as one. I have three awards from them already this year, now five with this latest pair. It’s the case that a lot of the wedding industry blogs and awards bodies have little to no interest in documentary wedding photography other than as some kind of fashionable buzz word which might help them sell stuff so it’s hugely satisfying to receive recognition from a body whose interests lie solely in the imagery itself. But enough waffle! 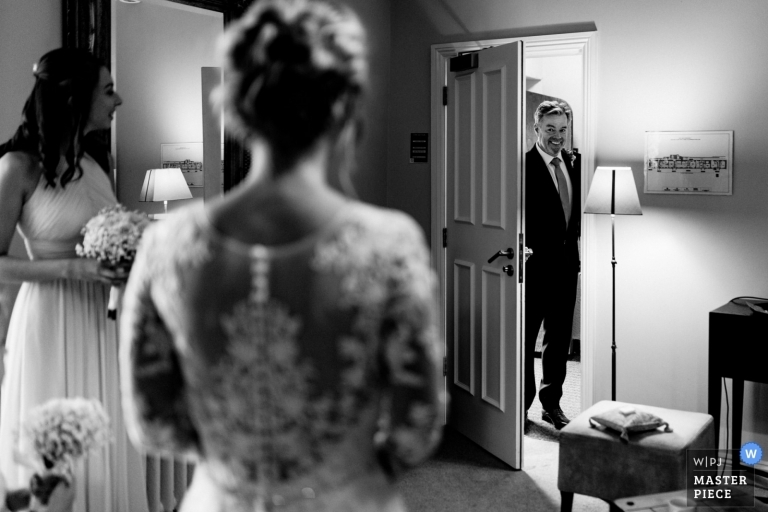 This image, taken from Rebecca and Jamie’s wedding at Dartington Hall in Devon obviously shows the moment Rebecca’s father first saw his daughter once she was ready to leave for the Church to marry Jamie. It’s one of those moments in the day that, although it doesn’t always happen, I will look out for in the process of building a story of the day around the people rather than the ‘things’. I knew Rebecca’s father was waiting out side the door to come in, it was a case of positioning myself to see him as he entered while still retaining other elements to give context to the image and allowing the attention to rest on his face. You don’t need to stage shots or try and pose emotion at weddings, in fact I don’t believe you can. It happens naturally, you just have to be there to see it. If you’re getting married and think that this kind of unposed, natural wedding photojournalism might work for you, then get in touch for a chat about your plans. I might just be the perfect photographer for you.